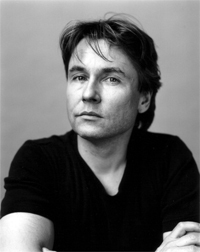 Esa-Pekka Salonen studied at the Sibelius Academy and made his conducting début with the Finnish Radio Symphony Orchestra in 1979. From 1985-1995 he was Music Director of the Swedish Radio Symphony Orchestra, and also in 1985 took up the post of Principal Guest Conductor of The Philharmonia which he held until 1994. He was Director of the Helsinki Festival in 1995 and 1996. Since 1992, he has been Music Director of the Los Angeles Philharmonic Orchestra. Salonen is renowned for his interpretations of contemporary music. He is the recipient of many major awards including the Siena Prize by the Accademia Chigiana in 1993, the first conductor ever to receive the prize. In 1995 he was awarded the Royal Philharmonic Society's 'Opera Award' and in 1997 received their 'Conductor Award'. In 1998 he was awarded the rank of Officier de l'Ordre des Arts et des Lettres by the French government. Esa-Pekka Salonen is recognised as an accomplished composer. He studied with Niccolo Castiglioni and Franco Donatoni in Italy. In January 1997 he premièred LA Variations with the Los Angeles Philharmonic Orchestra, by whom it was commissioned, followed by performances with the Royal Concertgebouw Orchestra in Amsterdam. Foreign Bodies, for orchestra, was premièred at the 2001 Schleswig Holstein Festival followed by the UK première at the BBC Proms. He premièred his most recent work for orchestra, Insomnia (commissioned by Suntory Ltd and the NDR) with the NKH Symphony Orchestra at Suntory Hall, Tokyo in November, 2002. Written for the opening of Walt Disney Concert Hall in 2004 Salonen wrote Wing on Wing as a gift to the Los Angeles Philharmonic Orchestra. His latest orchestral work Helix was commissioned by the BBC Proms and received its première on 27 August 2005 by the World Orchestra for Peace under Valery Gergiev.